The Moot is being held Halton Mill, Hill Lane, Halton, Lancaster, LA2 6ND. Cost is £25/£30 for the weekend. This includes full vegan meals and accommodation but no one will be turned away for lack of funds. Arrive Friday evening (from 6pm) for evening meal, leave Sunday (ends by 4pm). It’s an indoor floor sleeping space so bring a warm sleeping bag and mat too. The mill is 3 miles (1 hours walk) up the River Lune from Lancaster railway station and the 49 bus goes to Halton (last bus 7pm). The general principles behind Earth First! are non-hierarchical organisation and the use of direct action to confront, stop and eventually reverse the forces that are responsible for the destruction of the Earth and its inhabitants. EF! is not a cohesive group or campaign, but a convenient banner for people who share similar philosophies to work under. If you agree with the above and you are not racist or otherwise discriminatory, if you believe action speaks louder than words, then Earth First! is for you. Whether you think of EF! 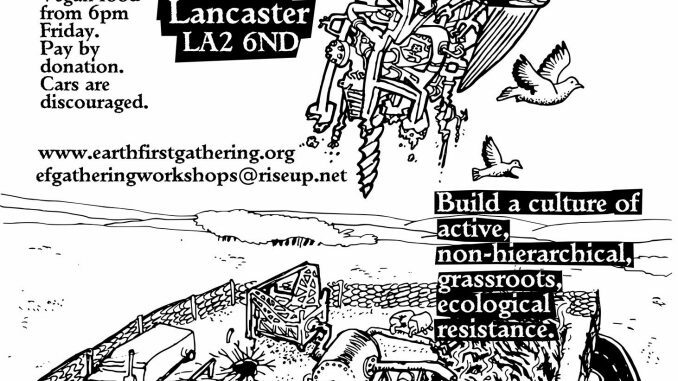 as a movement, a network, an idea or simply a name to use for actions, get involved – you are Earth First!